You sit down after a long and tiring day. You look at your feet and see that they have become the size of an elephant’s. Amazing feeling, isn’t it? Ok, enough with the sarcasm. Obviously, nobody wants to have swollen and sore feet, no matter what time of the day it is. Anything from long, tiring days to wearing high heels can trigger the swelling in your feet. This swelling is adamant; it takes a few days to go away and interrupts your day-to-day schedule. It’s time you stop suffering silently and stop treating this as a ‘not serious’ medical condition. A few hours of rest don’t always work in reducing the swelling. Here’s where our article will help you out. If you have recurrent swollen feet and this is not due to any serious medical condition, you can opt for many home remedies to reduce the swelling, soreness, pain, and also relax your mind. Before we go into details about the remedies, let us understand this condition a little better. Medically, any swelling in the body is called edema. When the body fluids accumulate in one part of the body, in this case, the feet, they become swollen. This swelling can or cannot be accompanied by pain, and it depends on the cause of the swelling (1, 2). Here are some easy remedies and practices you can adopt to get rid of swollen feet right in the comfort of your home. They are all easy to do and very cost-effective. Most of them use equipment and cures that are found in every home. Note: Depending on the level of swelling, you could add up to 2 cups of Epsom salt per bath. Fill half the bucket with warm water. Add salt to it and mix well. Soak your swollen feet in this saline solution for 10-15 minutes. You can also use common salt instead of Epsom salt. You can try this remedy any time you experience swelling. It is best done at night before retiring to bed. This is probably the most common remedy for tired and swollen feet. Epsom salt contains crystals of hydrated magnesium sulfate. These are very useful in curing muscle soreness and will give you immediate relief (3). 1. Fill the tub with enough tonic water to cover your entire foot (or feet). The tonic water should be cool or at room temperature. 2. Soak the affected foot in this water for 10-15 minutes. 3. Rinse the area using regular water later. Use this if you have swollen feet and have tonic water handy at home. For those of you living in the medical Dark Age, tonic water is carbonated water to which a little quinine has been added. Initially used as a cure for malaria, tonic water is also a good way to reduce the swelling of the feet. 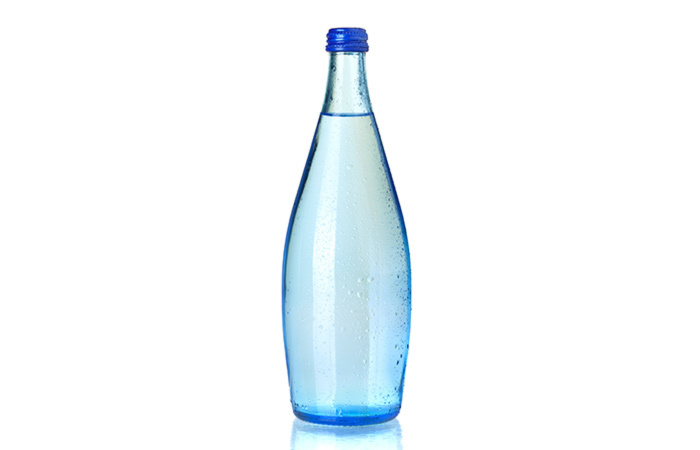 The quinine acts as an anti-inflammatory agent and the fizz in the carbonated water is a great relaxant (4). 1. Fill half a bucket with hot water and half of the second bucket with cold water. 2. Soak your feet in the hot water bucket first for 10 minutes. 3. Switch to the cold water bucket for another 10-12 minutes. 4. Switch back to the hot water one last time. This time, soak your feet for five minutes. A single routine of contrast bath will give you a lot of relief from the swelling. This is another way to alleviate swelling of the feet, and it uses the easiest of all mediums – water. One of the best natural remedies for swollen feet. The different temperatures of water work by encouraging better blood circulation in the feet (5, 6). As a bonus, you get some free time to read, listen to music, meditate or just chill! Do not use scalding hot water. 1. Boil rice and use the starchy water that you get once the rice is almost cooked. 2. Mix the baking soda with the rice water to make a paste. 3. Apply it over your feet and keep it on for 10-15 minutes. 4. Rinse your feet with water and moisturize them to keep them soft. You can also take a larger quantity of this paste, add some water to it and soak your feet in it. Use this paste as a quick remedy to reduce the swelling in your feet. This simple, unassuming ingredient has many remedial benefits. 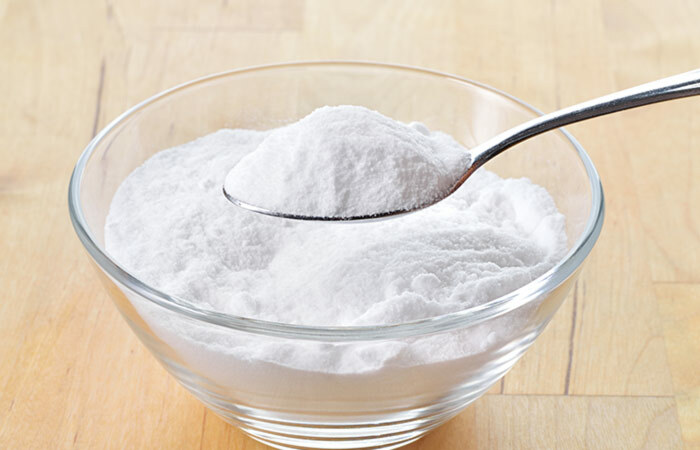 The baking soda in this mix possesses anti-inflammatory properties (7). In combination with the rice water, it absorbs the excess water that has accumulated in the feet. This remedy also improves blood circulation in the affected area. 1. Pour the essential oils in the water and stir well. 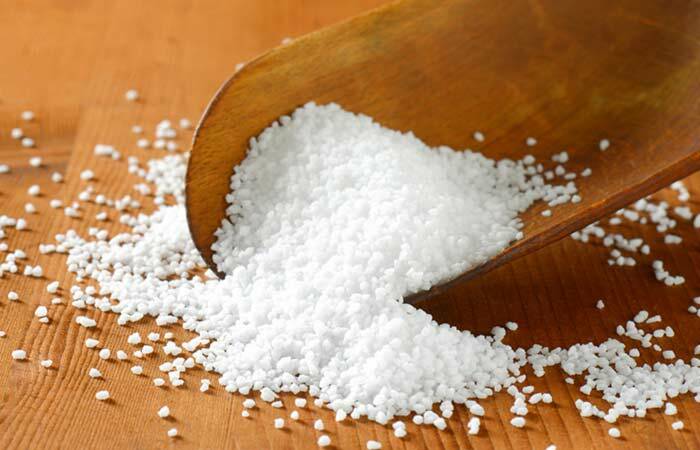 You can add ½ cup to 2 cups of Epsom salts to the soak to increase anti-inflammatory effects. 2. Soak your feet in this blend for 15 minutes. 3. Remove your feet from the water and pat them dry. Repeat this remedy once every day until the swelling goes away. 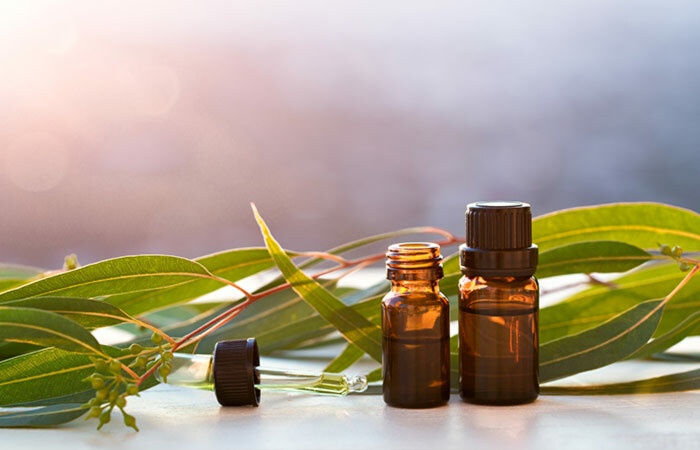 Essential oils have nothing to do with the word ‘important’; they mean that the oils contain the ‘essence’ of a particular plant. Besides alleviating the swelling in the feet, the combination of essential oils used in this remedy also acts as a natural relaxant through its beautiful aroma (8, 9, 10). 1. Mix the ingredients to get a paste-y liquid. 2. Apply it all over your swollen feet. 3. Leave it on for a couple of hours. This remedy is best used as an overnight solution for swollen feet. Do this before hitting the bed and have soft and swelling-free feet by the morning. 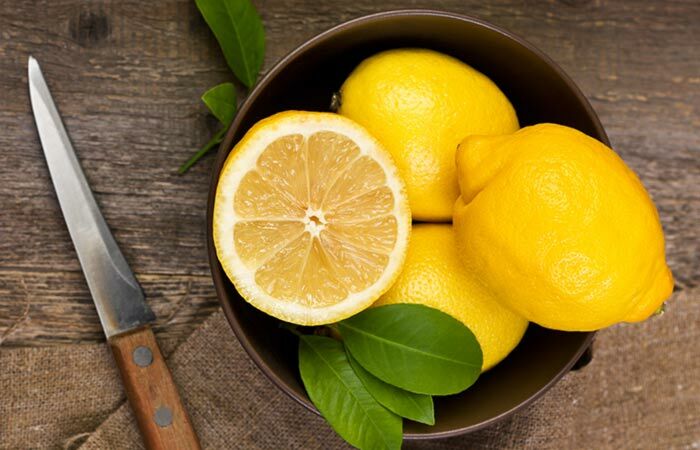 Lemon is commonly used both internally and externally for its anti-inflammatory properties (11). Cinnamon and olive oil also help in reducing swelling as they possess similar properties like lemon (12, 13). Olive oil will also nourish the skin on your feet and make it soft (14). Your feet will soak up all of these beneficial ingredients, and you will wake up without any swelling or stiffness. 1. Mix half cup of ACV with warm water and the remaining half cup with cold water in separate bowls. 2. Soak the towel in the warm water first, wring out the excess, and wrap this around the swollen foot. 3. Leave the towel on until it comes down to room temperature. 4. Repeat the wrap with the cold water-vinegar mix. Leave this wrap on for about five minutes. You can repeat this process once again after a couple of hours if the swelling does not subside. Strange, but true. 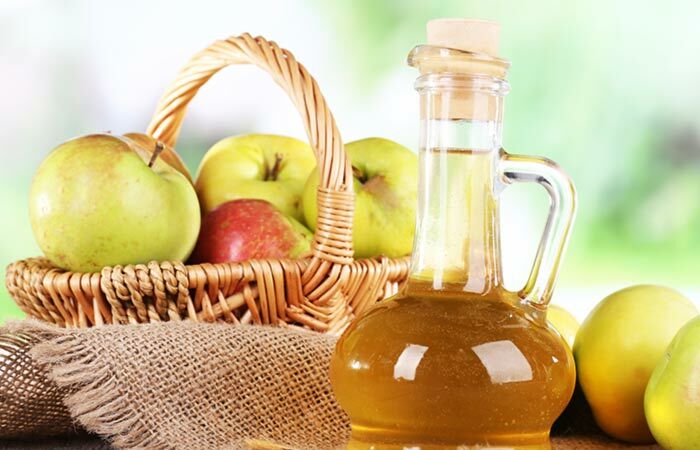 Apple cider vinegar, when applied to swollen feet and ankles, can provide immediate relief. The vinegar has an effective fluid absorption action, which makes the feet lose excess fluid build-up (15). Once the excess fluid is gone, the swelling and stiffness will vanish. This is one of the best swollen ankle remedies. 1. Steep the leaves in hot water a couple of times. 2. Strain and drink while the tea is warm. Drink two to three cups of this herbal tea in a day. If fluid retention is the culprit behind your swollen feet, you can bust it with this herb. 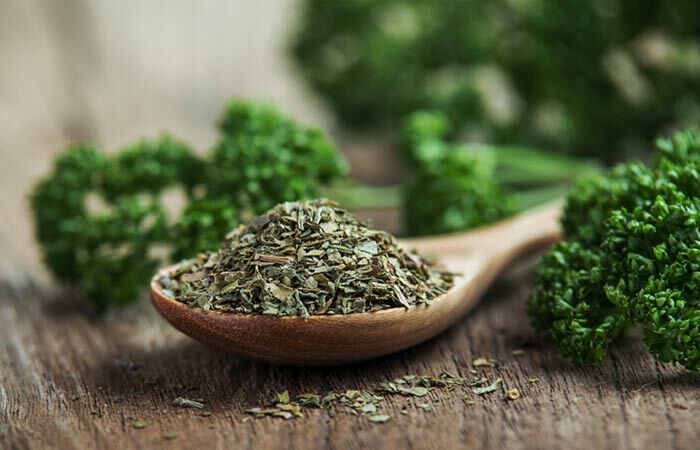 Parsley is a natural diuretic, which will help the body expel the excess fluid that has accumulated in your feet. Parsley also has anti-inflammatory properties (16). 1. Boil barley until the water takes on a light brown hue. 2. Strain and cool this solution. 3. Consume it either at room temperature or after cooling it in the refrigerator. Consume 1-2 glasses per day. I know it doesn’t really taste good, but this mixture is a wonderful diuretic. 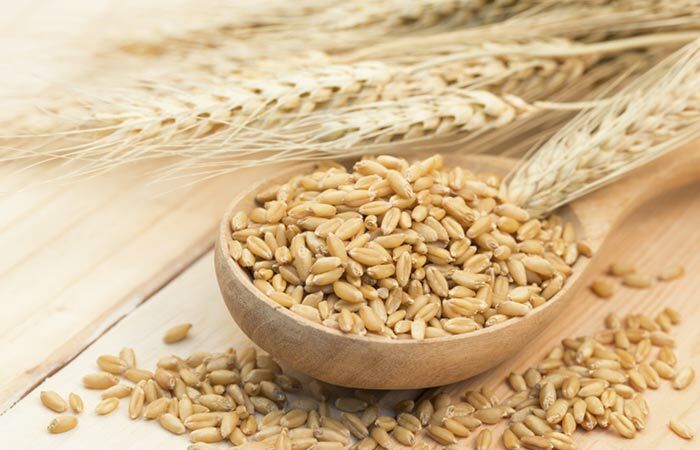 Barley helps the body wash out toxins that have built up due to fluid retention and brings down edema in the feet (17). 1. Boil the seeds in water until it reduces to half of its original volume. 2. Strain and drink this infusion. 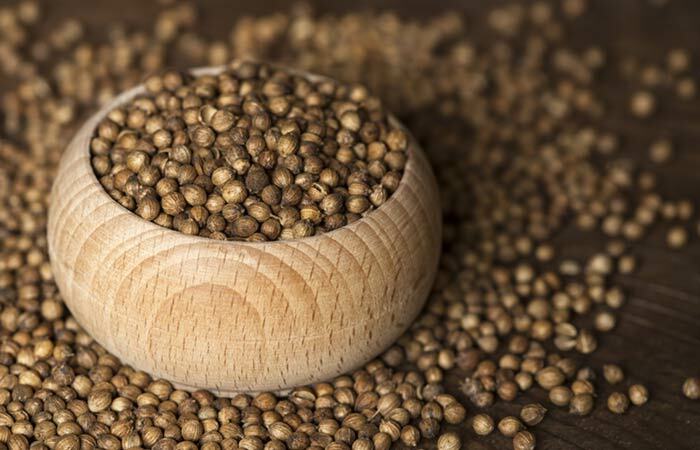 You can also soak the coriander seeds in warm water for some time and grind them to make a paste. Apply this paste on the affected area a couple of times, and see the swelling go down in no time. Being a diuretic, coriander will help the body easily eliminate the excess fluid in the swollen feet (18). The edema will go down once this happens and give you relief. 1. Mix the essential oil with the carrier oil. 2. Massage your feet gently with this blend for 5-10 minutes. 3. Leave the oil on overnight. 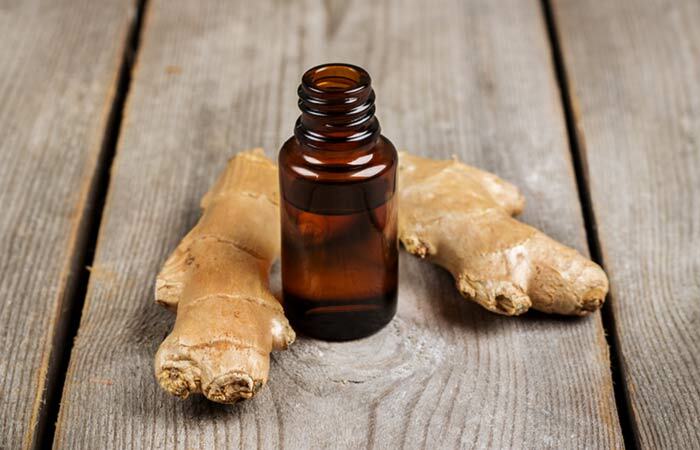 This oil contains the benefits of ginger without that sting. Ginger has natural anti-inflammatory properties. It improves circulation and also eases cramping caused by swollen feet (19, 20). 1. Mix the oils and massage the affected area with the mixture. Repeat this every night until the swelling subsides. 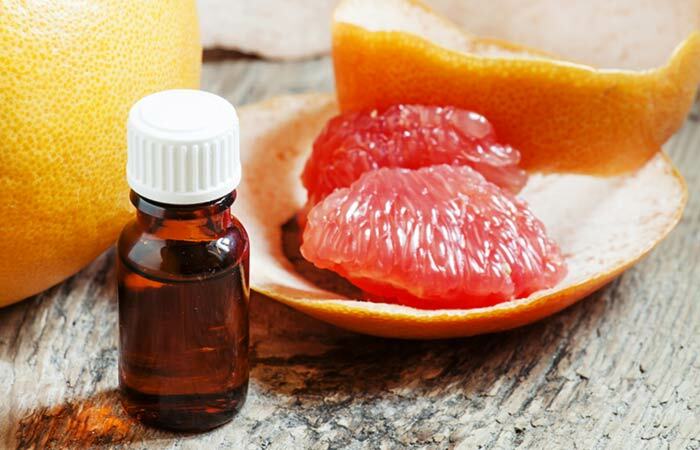 This essential oil is a wonderful anti-inflammatory agent because of its diuretic properties. It also possesses antimicrobial properties (21). 1. Place the ice pack for 10-12 minutes on the swollen area. 2. If you do not have an ice pack at home, you can make one with some ice cubes and a wet towel. Place the cubes on the towel, wrap it around and use it. 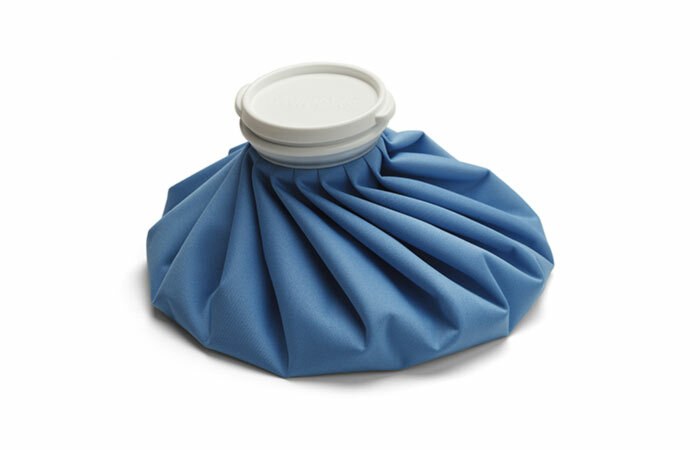 Repeat the application of the ice pack after a few hours if the swelling does not subside. Tried and trusted, our ever-faithful ice pack can help here too! The cold temperature of the ice pack alters the blood flow, which reduces swelling and pain (22). This is also one of the most effective home remedies for swollen feet. 1. 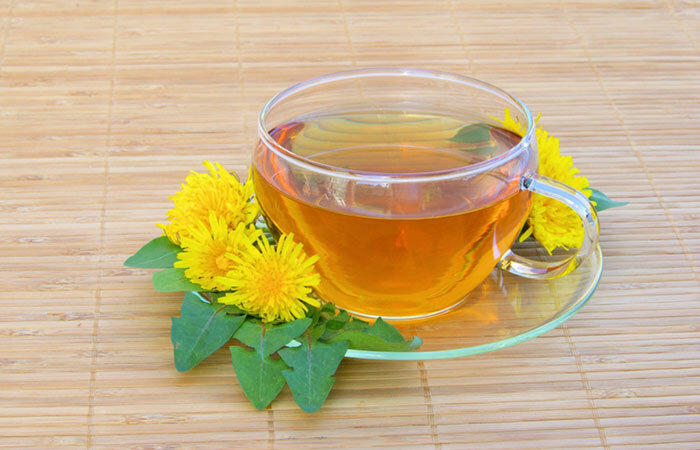 Make dandelion tea by adding the herb to boiling water and allowing it to steep for a while. 2. This tea is most effective if you have it while it is warm. Have 1-2 cups per day till you find relief from foot edema. This amazing herb has pretty good effects on swollen feet. Dandelion has water expulsive properties and is also rich in antioxidants (23). It alleviates inflammation in any part of the body effectively. 1. Cut the cucumber into thin slices. 2. Place these slices on your feet and cover them with a loose bandage. 3. Remove the bandage after 20-30 minutes and see the difference. You can also extract the juice of cucumber, add it to water and apply it to your feet to get similar results. You can use this remedy any time you experience swollen feet. The very name is soothing, isn’t it? 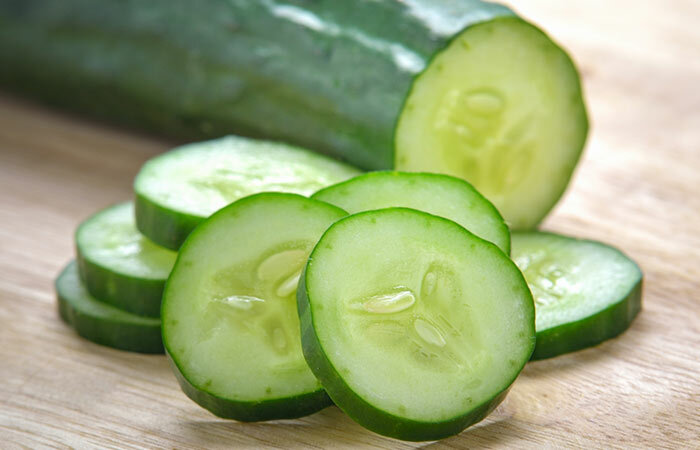 Cucumber has amazing soothing properties that will reduce edema and stiffness and make relieve your swollen feet (24). 1. Take cabbage leaves, wipe them clean, but do not wash them. You may experience more relief if the leaves have been cooled in the fridge (but not frozen). 2. Place them on your swollen feet or tie them there with a loose bandage. 3. Remove the leaves after 30 minutes. Do this again after 3-4 hours if required. Even though this remedy sounds peculiar, it is definitely one of the best ones for swollen feet. 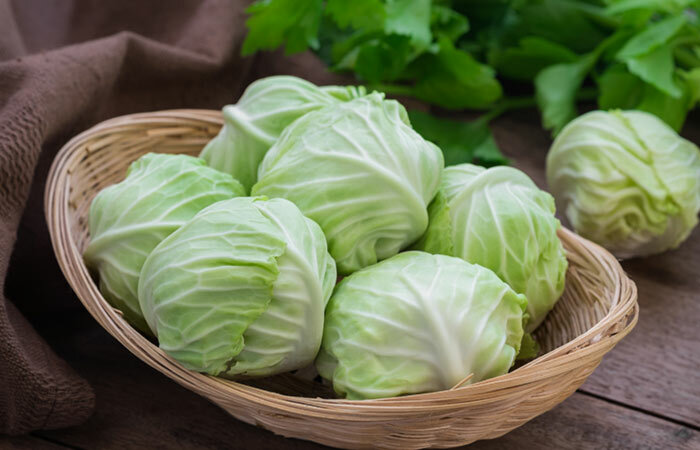 Cabbage has great water absorption qualities and will draw out excess fluid in the feet. It also has anti-inflammatory and healing properties (25). Most or all of these remedies might work for you. However, merely using these home remedies isn’t enough. You also need to give your feet ample rest to reduce the swelling. If you don’t take adequate care, you might fall victim to painful cramps, and the edema might even spread to the legs and knees. Let us now look at some commonly asked questions. 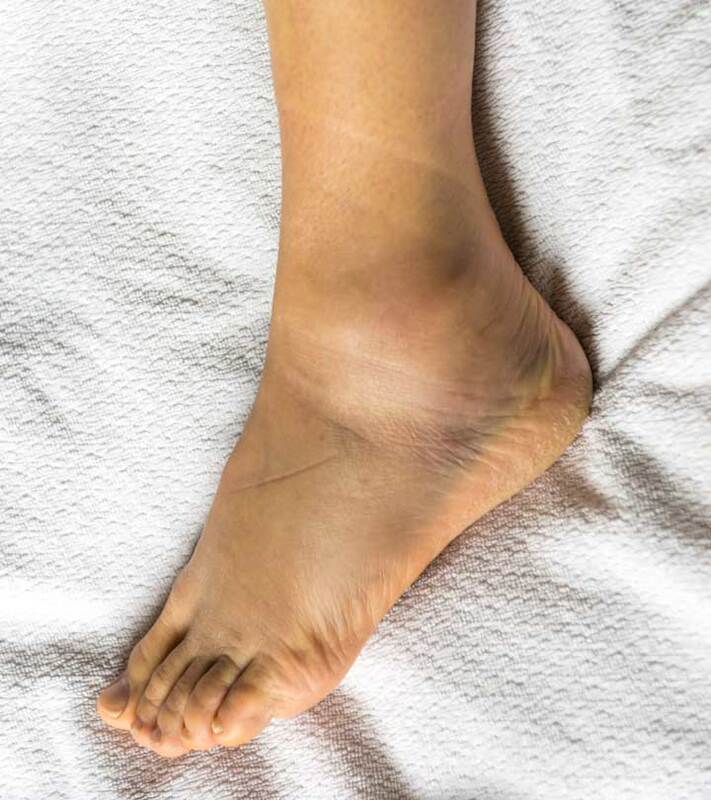 Apart from the main symptom of edema or swelling, which causes an increase in the foot and ankle size, the following symptoms can also be seen. These additional symptoms depend on the underlying cause of the edema (26). Elevate To Alleviate The Swelling – This is something you can try while sitting at work or lying down in bed at home. When at work, prop up your feet on a stool and keep flexing the ankles at regular intervals. When you are in the comfort of your bed, try elevating your feet to the point where they are at least a foot above the heart’s level. Prop them on a cushion or the wall for 5-10 minutes. I have tried it many times, and it is immensely and immediately relieving. Check What You Eat – The edema in your feet could very possibly be caused due to poor eating habits. Make sure you include a lot of magnesium in your diet as it improves circulation. Also, avoid foods high in sodium content as it is known to be water retentive. Avoid all inflammatory foods such as sugar, wheat, grains, dairy, corn, and soy. Have Enough Water – Stay as hydrated as possible. Don’t skip those 8-10 glasses of water that every website on healthy living screams about. Protein and uric acid build up in the body, cause foot swelling, and can be washed out by proper hydration. Shop For Better Shoes – If you have constant swelling in your feet, it might be due to the wrong footwear. Switch to cushioned shoes that provide enough support to the arches of your feet and send your feet to foot heaven! Opt for low-heeled sandals and also avoid tying your shoelaces too tightly. These will greatly benefit your sore feet. Banish The C-A-C – Okay, I just made up that code! It simply stands for Cigarettes, Alcohol, and Caffeine. Removing these three addictive elements from your lifestyle really helps in reducing foot edema, if nothing else. These three create water retention in the body. Whenever fluids build up, they mostly travel to the feet. A good reason to think about quitting now, isn’t it? Vitamin E Is The Key – Ensure you take extra amounts of foods rich in vitamin E – the beauty vitamin. Foods such as green leafy vegetables, almonds, pistachios, and sweet potatoes are replete with this vitamin. It is useful in alleviating swelling and stiffness of the feet (27). If you are pregnant, it is important that your feet get enough rest. The tips mentioned above, such as propping your feet up, work well in reducing the swelling. You can also use any of the home remedies listed in this article and get quick relief. Some of the most effective ones are Epsom salt, contrast baths, ice pack, and essential oil soak. If you are planning to use any of the remedies that require you to ingest anything, such as barley water or dandelion tea, please consult your doctor before doing so. Swollen Feet: Why Does This Happen? Standing Too Long: A long period of standing (or sitting) is the most common and simple cause of swollen feet. Injury: If you have sustained an ankle or foot injury recently, you can develop swollen feet for weeks afterwards. High Impact Activities: Extreme sports, running, etc. can all be probable causes for swollen feet, especially if you are ill-trained for them. Obesity: Well, the feet do carry a whole lot of extra weight; this is their way of complaining! Excessive Intake Of Salt And Alcohol: Both of these cause water retention and swollen feet. Some Medications: A few medications for diabetes, birth control, depression, etc. enlist edema of the feet as one of their possible side effects. Check with your doctor. 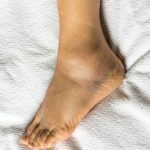 Besides these, some underlying medical conditions, such as arthritis, thyroid problems, allergic reactions, varicose veins, venous insufficiency, and lymphatic obstruction, may also trigger swelling (or edema) in the feet. Swollen Feet: Who Is At Risk? Swollen Feet: When To Seek Medical Help? Most cases of edema in the feet go away after a little bit of rest and elevating the feet. However, you must consider consulting a doctor if the swelling has started interfering with your normal day-to-day activities. If you develop pain, high temperature, local heat and redness, it is wise to mention this to your doctor. CAUTION: Pregnant women who develop infrequent urination, vomiting or nausea, blurred vision, and/or abdominal pain, along with foot edema, must rush to the doctor as it can indicate a life-threatening complication – preeclampsia. There are many alternative therapies like acupressure, acupuncture, and homeopathy for swollen feet. It is best to go for a treatment plan (or solution) that is safe for use and will not give you any side effects. 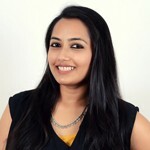 Natural remedies are the best options that easily fulfill this criteria and produce long-lasting results. For most people, these home remedies have helped them to get back on their feet in a jiffy! So, what are you waiting for? Try these remedies and see the results for yourself.